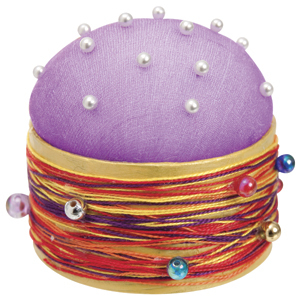 Create a handy pin cushion for mum to use when sewing. This gorgeous Mother's Day gift idea is simple to make and something which will be useful for the recipient. Choose fun, bright colours which may include Mum's favourite colour for a personal touch! Paint a Papier Mache Box with mum’s favourite colour. Set aside to dry. Keep the lid for another project. Take a handful of Polyester Filling and place it in a piece of Stocking to form a ball the size of an orange. Secure the ball with a knot. Glue the ball of filling into the inside of the box. Decorate the outside of the box with different colours of Broder Cotton glued around the box. Add beads around the box. Stick a number of Pearl Pins into the coloured ball of filling.